Energy is an essential part of modern life, so interwoven into everyday activities that we take it for granted unless we have to go without it. Fuels can simply be thought of as substances that store energy. Historically, wood was the fuel we burned for energy; we progressed to charcoal; then, with the industrial revolution, fossil fuels became dominant. Fossil fuels include coal, oil and natural gas (and many petroleum products). All of these fuels store energy chemically, which is converted into heat when they are burned. There are many ways to classify fuels. Fossil fuels were formed over hundreds of thousands of years by pressure and heat in the earth from the remains of plants and animals. Because they are being depleted on a much more rapid time scale than they can be formed, they are considered non-renewable. Fossil fuels release a large amount of carbon dioxide (CO2) into the atmosphere when they are burned, which is not balanced by the amount of CO2 removed by today’s natural processes (primarily photosynthesis in plants and absorption by the oceans). In contrast, renewable fuels are produced with sources that can be replaced relatively quickly: on a daily basis for wind or solar power, months for biofuels, and up to several decades for wood. Some renewable fuels (such as electricity produced from solar or wind) do not directly emit CO2 when used, but other renewable fuels do, (such as ethanol or diesel produced from biomass). In fact, renewable fuel can be chemically identical to fossil fuels; the important difference is whether CO2 has been removed from the atmosphere to produce the fuel, maintaining a balanced cycle (Figure 1). The term alternative fuels refers to forms of energy that are used instead of conventional fuels, i.e. the ones we usually use for a particular purpose. Most conventional fuels are fossil fuels, and alternative fuels are often, but not always, renewable fuels. A different type of fossil fuel than what is conventionally used is still an alternative fuel, such as natural gas to power vehicles (an alternative fossil fuel) instead of gasoline (a conventional fossil fuel). The reason to use an alternative fuel is to decrease either the cost of fuel, the amount of CO2 emitted or both. For vehicles, gasoline and diesel, both fossil fuels, are being replaced by ethanol, biodiesel, compressed or liquid natural gas, electric energy and chemical energy from hydrogen. Some of these alternatives can be produced with either non-renewable fuels or renewable fuels. While all fossil fuels produce CO2 and other compounds when burned, some types burn more cleanly than others. Coal tends to produce greater emissions than petroleum, which tends to produce higher levels of emissions than natural gas, although there are often variations between different sources of the same type of fuel. Renewable fuels are generally cleaner, but some can also produce CO2 and other pollutants – how much depends on many factors involved in their production. It can get confusing, so it is best to check the facts and beware overly broad generalizations. A comparison of the carbon cycle for biofuels (a renewable alternative fuel for vehicles) and fossil fuels is provided in Figure 1. When plants are grown to replace those converted to biofuels, the carbon moves in a short-term, balanced cycle and does not increase the overall concentration of CO2 in the atmosphere. However, the carbon cycle for fossil fuels requires millions of years to complete. 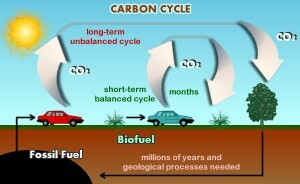 Burning fossil fuels, creates an unbalanced cycle that acts to increase our current atmospheric CO2 levels. The U.S. consumed about 18.8 million barrels of petroleum per day in 2012, which is about 21% of the world’s total usage. About two-thirds of the U.S. share of petroleum is burned for transportation. Vehicle fuel usage can be divided by cars and light trucks (63%), medium trucks (4%) and heavy trucks (17%). 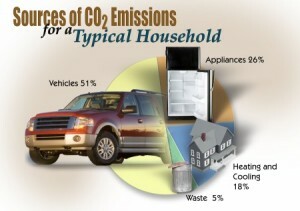 Petroleum use in vehicles is a large source of greenhouse gases (GHG), about half of a typical household’s carbon dioxide emissions (Figure 2), exacerbating climate change. About 20 pounds of GHG are created for each gallon of gasoline we burn. Alternative fuels could greatly reduce these emissions, although care must be taken when making comparisons. Figure 2. Typical Household Sources of CO2. [Click image for full size version.] Source: US Department of Energy. When alternative fuels are produced from some other source fuel, emissions from their entire production process must be included for fair comparisons. Although some alternative fuel vehicles are often termed “zero-emission vehicles”, in order for them to truly produce zero emissions, renewable fuels must be used at each stage of production. Cellulosic biomass Inedible plant materials containing fibrous cell wall (cellulose) such as grasses or woody plants. Waste materials can be used. Ethanol A liquid alcohol fuel, commonly fermented from corn or other biomass and added to gasoline. It also may be synthetically made from petroleum. Ethanol is a liquid alcohol fuel that is frequently fermented from corn, but many other plant materials, including other grains, sugar cane, or even algae can be used. While ethanol can be domestically produced, renewable, and is promoted as an environmentally preferable fuel, its emission benefits are variable. Because most U.S. ethanol is derived from crops, emissions associated with growing, harvesting, transporting and processing the crop must be included as part of ethanol’s emissions. 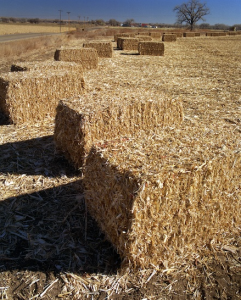 However, if waste cellulose material (wood, grass or crop residue) is used to produce ethanol (Figure 3), no farming emissions are attributable to the fuel and therefore ethanol use results in greater GHGs reductions. Several commercial scale cellulosic biofuel facilities have started in recent years or are in the works, including the Indian River BioEnergy Center in Vero Beach, Florida. Use of ethanol expanded about 8 fold between 2001 and 2013, as it became routinely added to gasoline (Figure 4). Most regular gasoline sold in the U.S. now is E10, containing up to 10% ethanol; cars built after 2000 can use E15 fuel (15% ethanol); and flex-fuel vehicles can run on E85, a blend containing up to 85% ethanol gasoline. About seven percent of existing vehicles and a quarter of new vehicles sold in 2014 were flex-fuel. Ethanol is less energy dense than gasoline, so it requires a greater volume of fuel to travel a given distance. Cars running on E10 blends generally get 3% – 4% fewer miles per gallon than gasoline, and another 15% – 30% fewer miles per gallon if using E85 fuels. The cost of E85 on a per gallon basis is generally less than gasoline, but the total cost to drive a given distance may be more for E85 due to its lower fuel economy. Soybeans, waste vegetable oils and animal fats can be converted into a liquid fuel known as biodiesel. A variation, synthetic diesel, is produced from cellulosic fuels. The commercially available biodiesel is usually blended with petroleum diesel in proportions ranging from 5% (B5) to 20% (B20). All diesel vehicles are approved to use B5 blends, and a number of popular pickup trucks and vans can accept B20 fuels. Engines must be specifically designed to use 100% biodiesel (B100). Use of biodiesel reduces GHG emissions, and vehicle performance is reported to be similar to standard diesel. In the lower Atlantic states (including Florida), in January 2015, the price for B20 was slightly higher than standard diesel, and B100 was almost 1 $ per gallon higher than standard diesel (Table 2). Figure 5. A CNG station at the Orlando International Airport opened in March 2015. Credit: Clean Energy Fuels Corp.
Lower natural gas prices in recent years have increased interest in vehicles fueled by compressed natural gas (CNG). CNG is used for municipal and commercial fleet vehicles, and some passenger cars. A few bi-fuel models can switch automatically from CNG to gasoline when needed. Purchase prices are relatively high for these vehicles, but they are less expensive to operate on CNG than gasoline (Table 2). Although natural gas is a fossil fuel, its GHG emissions are somewhat less than those from gasoline, and emissions can be very low if a renewable biogas source can be found. Biogas sources are uncommon presently, but may be a future option. There are currently 18 public CNG fueling station locations in Florida (Figure 5) and 9 more planned. These locations and those of stations supplying other alternative fuels nationwide can be found on a Department of Energy website. Propane is a hydrocarbon gas (and a fossil fuel), also called liquefied petroleum gas (LPG) that is produced as a by-product along with natural gas. It is most often used to fuel trucks, vans and small work vehicles such as forklifts and commercial lawn mowers (Figure 6). Passenger vehicles can be changed to dual LPG/gasoline fuel vehicles with conversion kits or the existing system can be replaced to operate solely on LPG. LPG is less expensive than gasoline and burns somewhat more cleanly than petroleum products, but GHG emissions from LPG are only about 10% less than from gasoline. There are several types of vehicles using electric motors powered by electricity stored in batteries or a combination of electric and internal combustion engines. The electricity to charge the batteries can be generated by any type of fuel, including renewable sources (Figure 7). Plug-in electric vehicle (PEV) applies to all vehicles that are powered either completely or partially from the electric grid. These can be subdivided into battery [only] electric vehicles (BEV), or vehicles with batteries plus a second power system to extend the vehicle’s driving range after the batteries have discharged. These dual system vehicles are called plug-in hybrid electric vehicles (PHEV), if their electric motor supplements a smaller gasoline engine, or an extended range electric vehicles (EREV), if the supplemental system is an on-board electric generator run by a gasoline engine. The generator continues to supply the car’s electric motor when the battery is depleted. Note that the more common hybrid electric vehicles (HEVs) such as the original Toyota Prius, are not plug-in electric vehicles (PEVs). Their electric batteries are charged by energy captured when the vehicle’s brakes are applied or generated by the electric motor while traveling on gasoline power, not from the electric grid. Sales of PEVs have grown rapidly since 2010, and many new competitively priced ($25,000 – $40,000) models of PEVs are on the market. A Federal tax credit of up to $7,500 effectively reduces the initial purchase price. Fuel and maintenance of electric cars are less than their conventional counterparts. An average electricity cost for operating a PEV is about $0.3 to $0.5 per mile, equivalent to paying $0.98 per gallon of gasoline. Compared to recent gasoline prices in the range $2 – $4 per gallon, PEVs offer savings of 50% to 75% on fuel costs. Carbon dioxide (CO2) emissions from electricity to power a PEV are reduced by about half from those of a gasoline engine. While an average gasoline car gets about 25 MPG; emission from electricity generated in Florida are equivalent to emissions of the same gasoline car achieving 51 miles per gallon (about twice the mileage). The major limitations of PEVs are being addressed, making them a feasible choice for many Americans. The range on battery power of current BEVs meets the needs of about 69% of U.S. commuters, with improvements expected. Public charging stations have become easier to find, and workplace charging is more common. Dual system PHEVs and EREVs are not constrained by the need to recharge on long trips. Hydrogen Fuel Cell Vehicles (FCVs) have electric motors like PEVs, but they do not run on batteries. Instead hydrogen gas (H2), usually carried in a high pressure tank on the vehicle, functions like a battery to store energy. The fuel cell combines H2 and oxygen from the air, releasing energy and converting it to electricity (Figure 8). The only emission from the car is water vapor. Hydrogen gas does not occur naturally but can be generated by many methods, all of which require energy. Renewable or non-renewable fuels can provide this energy. Whatever the source, the energy input and emissions associated with producing and compressing the H2 must be considered to accurately evaluate the cost, efficiency and environmental effects of fuel cells. Because there are always losses in the output of useable energy when it is converted from one form to another, hydrogen fuel cells are less efficient than direct use of the source fuel. But, compared with gasoline, FCVs can reduce GHG emissions by at least 30%. FCVs have other advantages: they are lighter weight and faster to refuel than batteries in PEVs and they can travel 250-300+ miles before refueling. Two major challenges to be overcome are the expected high purchase price for FCVs and the lack of refueling stations. Refueling is also likely to be more expensive than gasoline. Before they can be cost competitive, the total price for H2 must be under $4 per kilogram, which is roughly equivalent to one gallon of gasoline. It is not yet clear whether FCVs can become efficient and cost effective enough to compete with plug-in electric vehicles for most consumers. It is possible to split molecules of carbon dioxide and water and recombine their hydrogen, carbon and oxygen to make hydrocarbon fuels. Scientists and engineers around the world are working to develop solar powered refineries to produce fossil fuels from only the same raw materials that plants use for photosynthesis. The individual steps of the process are understood, but at present are too costly to compete with other fuels. If they can be efficiently and economically produced, hydrocarbon fuels could become carbon neutral, capturing CO2 from exhaust gasses of power plants or industrial facilities, and turning it into hydrocarbon fuels, which are then burned to provide power. In this process, CO2 is recycled rather than discharged to the atmosphere, and would not increase GHG concentrations as fossil fuels do. 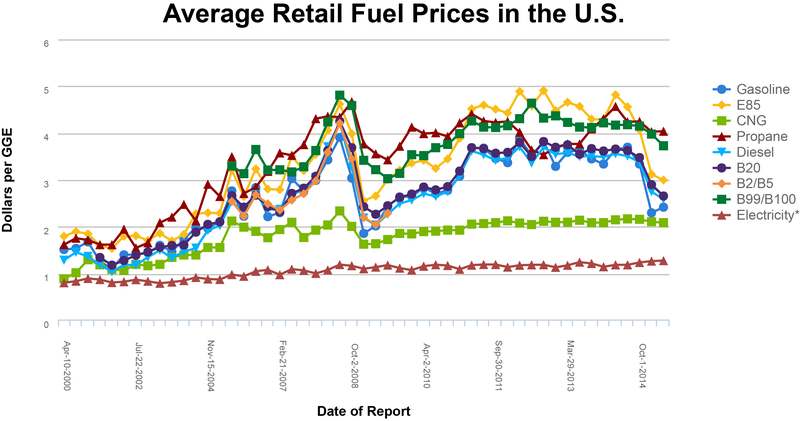 The prices for alternative fuels since 2000 can be compared in Figure 9. Note that these costs are based on nationwide average retail costs, but have been adjusted to be equivalent to the performance of a gallon of gasoline. This accounts for the varying energy levels from different fuels and allows for a direct comparison to gasoline. The need to reliably be able to re-fuel while traveling is an issue that must be addressed before large numbers of consumers are willing to switch to alternative fuel vehicles. Mobile apps and web sites are available to help drivers locate public refueling or charging stations. The Department of Energy, Alternative Fuels Data Center’s interactive maps locate all types of alternative fuel stations. A comparison of costs for refueling expressed as the functionally equivalent cost of gasoline is found in Table 2. 4 Values reported in Clean Cities Alternative Fuel Price Report footnotes due to small sample sizes (7 for hydrogen, and 40 for LNG). Nationwide, many states have been accelerating incentives promoting alternative fuels and new vehicle technologies. The largest share have been for development of natural gas vehicles and infrastructure, followed by electric vehicles, biodiesel and ethanol production incentives. Some utilities and private companies also offer incentives to their customers for electric vehicles, ethanol and propane fuels. The types of incentives being offered include grant funding, tax rebates, purchase rebates, loans and leases. Florida offers a rebate on a new or converted natural gas or propane vehicle for 50% of the incremental cost of the vehicle, up to a limit of $25,000 per vehicle and $250,000 annually per applicant. A Biofuels Investment Tax Credit is also available, covering 75% up to $1 million of costs associated with all stages of biofuels or other renewable fuels development, production and distribution, through 2016. S. Government, www.fueleconomy.gov, Ethanol, and Biodiesel. University of Florida IFAS Extension, How Ethanol Is Made from Cellulosic Biomass. Department of Energy (DOE), Vehicle Technologies Program, Hybrid and Plug-In Electric Vehicles. 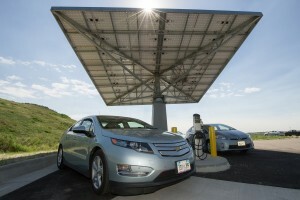 DOE Alternative Fuels Data Center, Fuel Cell Electric Vehicles. gov, Office of Energy Efficiency & Renewable Energy, Video Energy 101: Fuel Cell Technology. Union of Concerned Scientists, Battery Electric and Hydrogen Fuel Cell Electric Vehicles (2014) . Union of Concerned Scientists, How Hydrogen is Made (2015). Union of Concerned Scientists, The Impact of Hydrogen Production Methods on Global Warming Emissions. 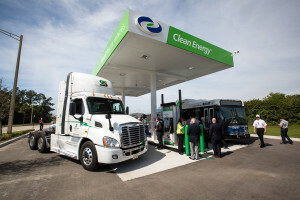 California Energy Commission, Consumer Energy Center, Compressed Natural Gas (CNG) as a Transportation Fuel. US DOE, Clean Cities Blog, CNG and Fleets: New Publication Builds a Case. CNG Now!, What is CNG?. Department of Energy (DOE) Alternative Fuels Data Center, Propane. S. Government, www.fueleconomy.gov, Propane: Liquefied Petroleum Gas (LPG). 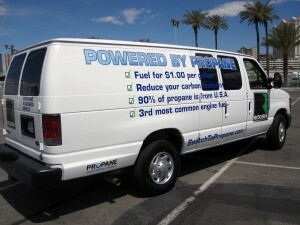 California Energy Commission, Consumer Energy Center, LPG – Propane as a Transportation Fuel. Stacy C. Davis, et al., Oak Ridge National Laboratory for the US DOE, Vehicle Technologies Office, Transportation Energy Data Book: Edition 33, July 2014, pg. 1-1. U.S. Department of Energy (DOE), Reduce Climate Change, accessed 21 April 2015. Renewable Fuels Association, E85, accessed 21 April 2015. U.S. DOE, Ethanol, accessed 21 April 2015. U.S. DOE, Clean Cities 2014 Vehicle Buyer’s Guide. Clean Cities, Alternative Fuel Price Report, January 2015. U.S. DOE, Clean Cities 2014 Vehicle Buyer’s Guide, accessed April 23, 2015. 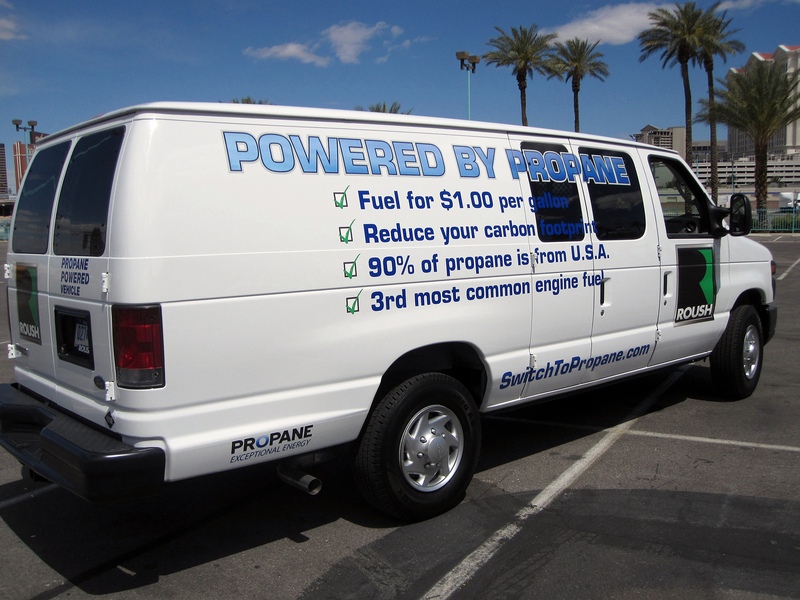 U.S. DOE, Propane: Liquefied Petroleum Gas (LPG), accessed April 27, 2015. University of Central Florida, Florida Solar Energy Center, Drive Electric Florida, 2014. Union of Concerned Scientists, Infographic, 2013. The chemical energy per mass of hydrogen (142 MJ/kg) is at least 3 times larger than of liquid hydrocarbons. Union of Concerned Scientists, Fact Sheet, How Clean are Hydrogen Fuel Cell Electric Vehicles?, September 2014. Anita Lienert, Edmunds.com, 2015 Hyundai Tucson Fuel Cell to Lease for $499/Month, January 23, 2014. Jaclyn Trop, Automotive News, Toyota sees fuel cell car, priced at $57,500, gaining traction in small steps, November 17, 2014. Yoko Kubota, The Wall Street Journal, Honda Delays Fuel-Cell Car Launch Until 2016. November 17, 2014. U.S. DOE, Hydrogen Production, accessed 4-23-15. Geoffrey Ozin, Materials Views, Solar Refinery: Can we have our carbon cake and eat it too?, February 24, 2015. US DOE, Alternative Fuels Data Center, Technology Bulletin, January 10, 2014.